Once every year Art Beatus Gallery will select to show a non-Chinese artist in its exhibition space. To time with the arrival of spring, we are to exhibit the naturist works of Australian artist, Paul Margocsy. Aged 61, Margocsy has received no formal drawing training. He started his artistic pursuit in 1974 painting murals for children・ nurseries. After four years, he became deeply interested in doing wildlife art and became a member of "The Wildlife Art Society of Australiasia". He won the first prize for best painting in early 1980・ and was featured as one of the 70 best living artists in Australia in 1990. 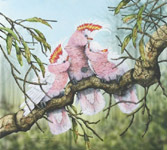 Australia Post commissioned this self-taught artist to do a series of stamps on water birds in 1991 and the United Nations, in 1994, also commissioned him to paint a series on endangered species. Over the past twenty odd years, Margocsy has had successful solo exhibitions in London, Japan, America and Singapore. He completed the works for the coming Song of Nature exhibition in 2005.